Teaching the players how to retain a numbers up advantage in the backline while attacking against a 4-4-2. Objective: The defenders work on maintaining a numberical advantage at the back against two forwards. 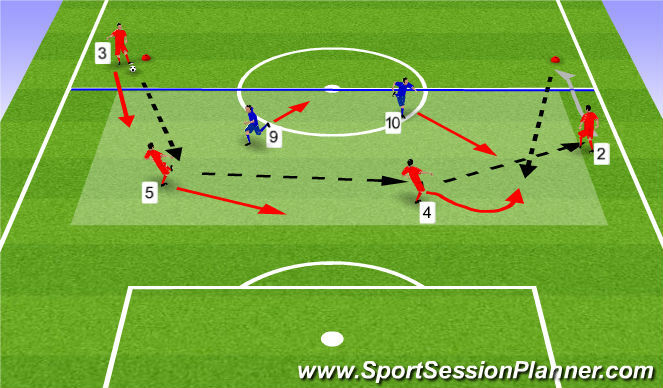 Description: Three yellow defenders and two red forwards start inside the low zone. The practice starts with the red full back (#3) who is positioned on the red cone. The blue forwards defend in a passive way as the red defenders pass the ball to the other side&apos;s full back (#2) who receives and moves forward. As soon as the #2 moves out of the first zone, the weak side&apos;s full back (#3) moves into the line with the deeper positioned blue forward in order to create a 3v2 situation. Additionally, the other defenders move according to the new position of the ball. 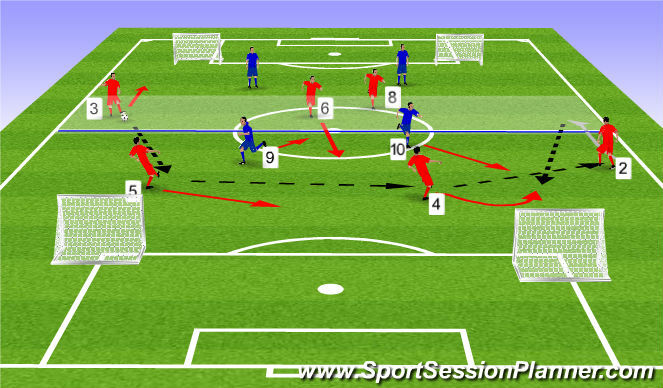 As soon as the #2 reaches the red cone, they pass back and the ball is then directed toward the other side with the same aim in the opposite direction. There should always be a 3v2 situation inside the first zone. Coaching Points:1) the players need to make sure all their passes are accurate to replicate real match situations. 2) There needs to be good synchronization in the players&apos; movements, so as soon as one full back moves forward, the other one needs to drop back to maintain the 3v2 advantage. 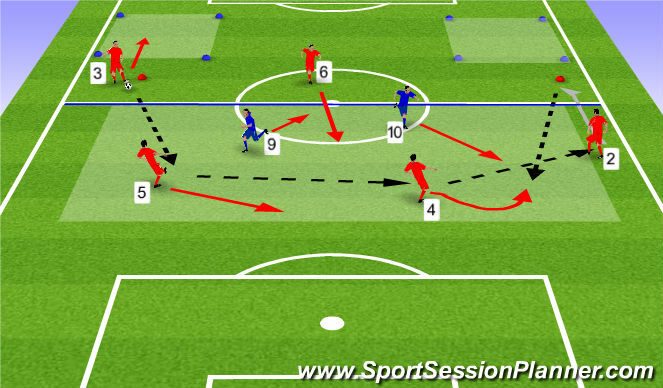 Description: This is a progression of the previous activity but now with the addition of 1 defensive midfielder who take up positions in the high zone. With the addition of the defensive midfielder, it enables both full backs to be in advanced positions at the same time. After the full back passes the ball to the center back, he now has the option of moving inside the blue zone (advanced position). The defensive midfielder must be aware of the full back&apos;s positioning in order to drop back (in line with the deeper positioned blue forward) to maintain the 3v2 numerical advantage at the back. If the full back decides to enter the low zone as in the previous activity, there is no need for the defensive midfielder to drop back. There should always be a 3v2 situation inside the low zone, whether it is the weak side&apos;s full back or a defensive midfielder who drops back. Description: 6 v 4 to mini goals. Same starting progression as previous activities with red team always starting with the ball. An additional midfielder has been added to the red team. Red team can only attack with 3 players inside the attacking zone. Objective: Must maintain 3v2 numerical superiority in the defensive zone with either one fullback staying OR one midfielder dropping in. Description: Play 8v8 or 9v9 small sided game. There are two blue forwards and four red defenders in the low zone. Objective: The aim of the red team is to score, but they should always retain superiority in numbers inside the low zone in order to defend successfully in case possession is lost. The blue players try to win possession in the high zone and then direct the ball immediately towards one of the two forwards inside the low zone with the aim of scoring a goal.